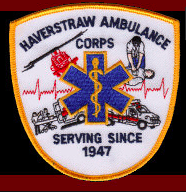 There will be a press conference Wednesday, December 27, 10:30 a.m. at the Haverstraw Ambulance Corps. to announce special pre-hospital medical service that is now available for the Haverstraw Town Police K-9 Officer Chase. K-9 officer Chase is an important addition to the Town of Haverstraw Police Department and considered a member of the service. First responders want to be able to provide the same commitment to him, and any other K-9 officer serving in the community, that is offered other officers and the general community. Haverstraw EMS will now carry K-9 first response kits on all three of its ambulances and have assembled one to be provided to and carried by Rockland Mobile Cares Medic-1, the Paramedic Unit that covers our area. These kits will carry many of the necessary supplies including Narcan, to render immediate care to Officer Chase or other K-9 officers, in an emergent situation. Additionally pet oxygen masks have been made available in the event the delivery of oxygen is required. These masks are designed to fit over the “snout” of the K-9 in an effort to deliver the appropriate, most effective amount of oxygen if needed. Recent approval by the State of New York allows ambulances to transport K-9 members of service to an emergency animal hospital for treatment if required and having equipment designed specifically for them is an asset.